Welcome to Tomato Talk—a full season of tomato-growing. In August, tomatoes become the stars of the vegetable garden. With sunny and warm weather, tomatoes planted in June should begin bearing buckets of juicy orbs. But critters, from birds to deer to a curious chipmunk, can put a dent in the harvest. 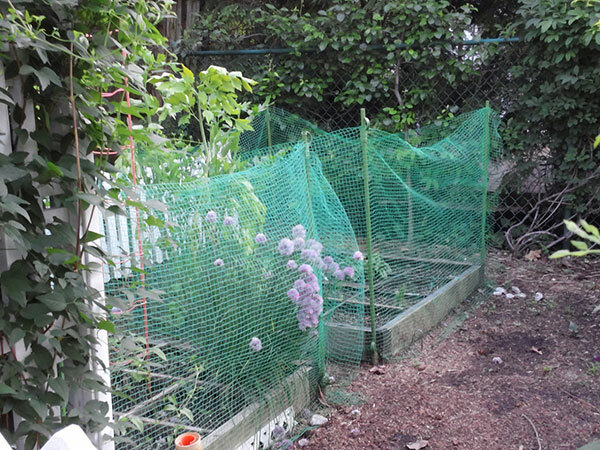 Bird netting helps protect tomato plants in the garden. Barriers, such as fencing, prevent animals from getting the goods. Chickenwire or plastic mesh fencing or lightweight bird netting (available at garden centers) can be installed around a pot or a row of plants. If rabbits are the bane of your garden, you’ll also want to bury the netting a few inches below the soil to prevent them from digging underneath. Deer and rodents are not fans of the allium family (garlic, onion), so one of the most effective methods of keeping them from eating your tomatoes (or peas, or roses, or anything else in your garden) involves making your plants smell unattractive. Crush a clove of garlic and put the crushed clove in spray bottle full of water. Let it stand overnight, then spray the solution on the leaves of your plants. Repeat once weekly. Looking for a stronger solution? Buy garlic oil concentrate at your local garden center to add to your water. 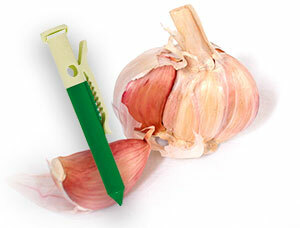 Buy garlic oil repellent clips from your local hardware store or garden center. These clips will last all season long (six to eight months), and work in a variety of applications. You can put them in chipmunk or vole tunnels, attach to fruit trees or berry bushes to deter deer browsing, or put at the base of your fencing to deter rabbits from digging underneath. TomatoTalk 6 – Do I need to use fertilizer? Looking for one-on-one tomato assistance? Contact our Plant Information Service for a personal diagnosis and recommendations.